True to its name, the Burrowing Owl nests in a hole in the ground. Although it is quite willing to dig its own burrow, it often uses one already provided by prairie dogs, skunks, armadillos, or tortoises. 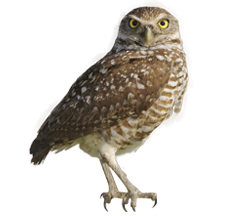 Burrowing Owls are small, long legged, short tailed owls with no ear tufts. Unlike most owls in which the female is larger than the male, the sexes of the Burrowing Owl are the same size. Adults have spotted backs with bars of lighter color on their chests. Juveniles have fewer bars on their chests and fewer spots on their backs. Chest coloration ranges from buff to dirty white with a dark collar. The Burrowing Owl appears to be diurnal because it can often be seen foraging during the day. In fact, it hunts all day and night long and is most active in the morning and evening. It catches more insects during the day and more mammals at night. Burrowing Owls live in dry, open areas with no trees and short grass. Found on golf courses, cemeteries, airports, vacant lots, university campuses, pastures, and prairie dog towns. They nest in burrows, often dug by a mammal. The burrow can be several meters long, with numerous twists and turns and are often lined with manure. The dung attracts dung beetles, which the owl then captures and eats.